This duo performance from Wheel Wheel Sensation is a harmonic show that highlights strength, romance and trust. Inspire your audience by one of the most traditional circus disciplines. 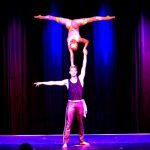 Duo Acrobatics: the skill of hand-to-hand lifting and body balance combined with gymnastics moves. It is a perfect show for public, private or corporate events, product launches, exhibition and fairs, open-air events and festivals. The dynamic movements and powerful strength will impress the audience and make any event a special experience. This show can take place anywhere, no matter how big the location and what kind of floor covering! The performance works great in combination with one of the other shows from Wheel Sensation. For example, Cyr Wheel or German Wheel is a perfect addition. The hand-balancing artist is a talented and versatile performer whose flexibility and strength are highly impressive. 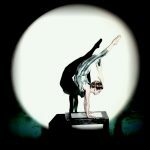 The artist harmoniously connects handstands with artistic and contortion. This dramatic display of bending and flexing of the human body is fascinating to watch. The audience admires aesthetic forms with powerful postures. These eye-catching movements combine beauty, passion and elegance. This dynamic show is perfect for public and private events, fairs, open-air events and company parties. 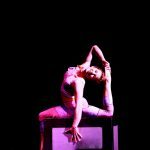 This show act is suitable for small locations and can be performed on limited space. 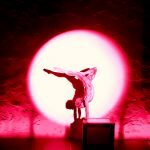 The artist starts inside the box and surprises the audience by coming out of the box and performing her routine on top of the box. 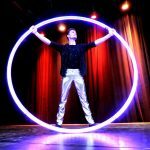 It is a highlight for private parties, company events or in combination with an Aerial Show from Wheel Sensation. Customization: Adaptation to special wishes is possible. Theme, outfits, music and duration is flexible and individually selectable on request.